300 years in the future, our shattered Earth is recovering from the Great Cataclysm. An event that wiped out human civilization, brought about the return of magic, and has made Earth into something both familiar and alien. Humans transform and augment their bodies with bionics, robot exoskeletons, psionic-inducing brain implants, chemicals and magic to survive. Tears in space and time – the Rifts – are doorways to anywhere. Open one and step through it to travel anywhere on the planet in a matter of seconds. Alien and supernatural beings use them to travel across the Megaverse® to arrive on Earth. You are one of the champions, the heroes of mankind, or an explorer or truth-seeker who braves the savage wilderness and dares to face the demons, dragons, aliens and weird creatures from the Rifts. More than 30 unique player characters, including mutants, dragons, Crazies, Juicers, Glitter Boys, Cyber-Knights, Ley Line Walkers, Bursters, Psi-Stalkers, Mind Melters and more. Select super-science, psionic powers or magic as your weapons of choice. Magic, psionics, power armor, giant robots, and human augmentation. Explore a world as weird and unique as any 50 alien planets. Open a Rift to anywhere. A complete role-playing game of science fiction and adventure. I have purchased a few Rifts PDFs from DriveThruRPG and they won't open on my Android ebook reader. Does anyone know of a reader that opens these PDFs and allows you to save bookmarks? It would be nice to see this as POD with a cardstock cover (like the 1st edition books). Are there plans to offer print edition? No, not really. Every page has a bookmark, and the ads in the back have their own separate bookmark. 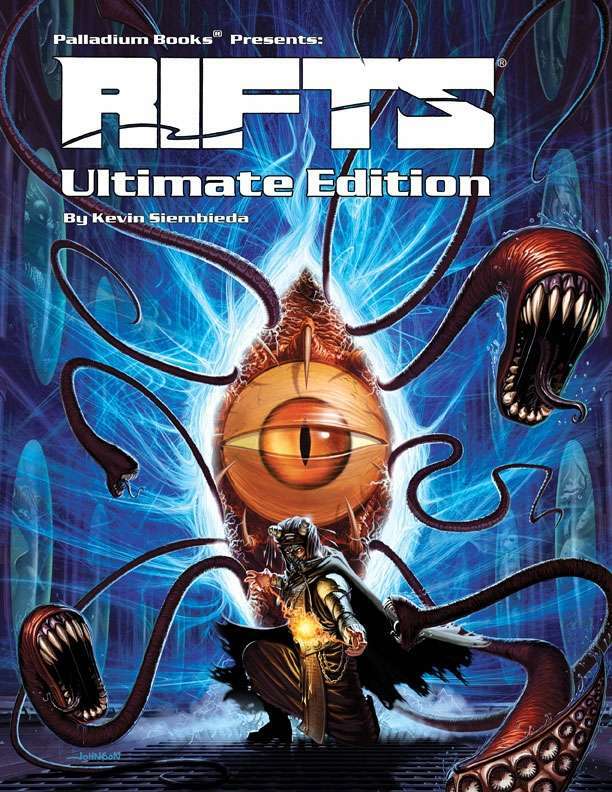 For example, the first page after the cover is bookmarked as "Rifts Ultimate 001" where 001 equates to the "Warning!" page (page 1). The bookmark numbers continue to 002, 003, 004, etc. all the way up to 376, which is just after the "Final Thoughts" page. My hope is I'll be able to add my own bookmarks (one for every chapter and relevant section) unless there are plans from Palladium to add this functionality. However, it is text searchable. That is unfortunate. I guess I'll have to bookmark it myself, but I wish they would do it for me. I hate to ask this but are you sure you are looking at the bookmarks and not the page marks? Not a problem man, that's an understandable concern. Yep, I'm looking at the bookmarks (on my Samsung Chromebook 2, on my PC using Adobe Acrobat Pro, and on my Nexus 5 using ezPDF Reader). Can anyone confirm they fixed the text flow problems? I'm looking at my copy right now, and I don't see any text flow problems. If I remember correctly, it's in the Borg section. If you read through the Class Features(?) the left and right columns have reversed flow. For example, points 12, 13 and 14 on the left and 9, 10 and 11 on the right. Are you talking about the section on the Combat Cyborg O.C.C.? So far, I don't see what you're talking about. Can you point to a page number? Yep. That's the area I'm referring to. A cool illustration of a Borg with a chainsaw sword and a mini-gun on his wrist. I can't cite the specific page though. Yes, I see the illustration you mentioned. I do not see any text flow issues in that section (I have the pdf only--not a hard copy). The points are in numerical order, not with the higher-numbered points in the left column and the lower-numbered points in the right column, which is the problem you described. There are no flow issues when reading from one column to the next. All the columns in this section are continuations from the previous column. They are not reversed. The problem you described is not in the Borg section of this pdf (but the picture you described is). This title was added to our catalog on April 30, 2016.